In his speech before an invitation-only crowd of Monument opponents, President Trump declared that he was there to “reverse federal overreach” and asserted, “Past administrations have severely abused the purpose, spirit and intent of the century-old law known as the Antiquities Act.” But while President Trump referenced the “smallest possible area” language in the Antiquities Act, his own actions to shrink these National Monuments are the real overreach. This is a political hatchet-job designed to open up these national treasures to industrial exploitation, make no bones about it. These landscapes have retained a largely wild and natural state, with the exception of being overrun by livestock, for thousands of years. The coal industry has long had designs on coal mining in Grand Staircase – Escalante, and a neighboring strip mine already is chewing up the habitat for America’s southernmost population of sage-grouse and despoiling the scenic vistas for visitors to Bryce Canyon National Park. At Bears Ears, there has been leasing of federal public lands for oil and gas drilling, with more planned nearby. When you look at the lands removed from National Monument protection in both of these areas, it is no coincidence that the lands opened to development have the highest potential for fossil fuel extraction. The Grand Staircase – Escalante National Monument was established specifically to protect the Grand Staircase. This geological wonder represents the only complete record of the region’s sedimentary rock strata, dissected by slot canyons and replete with important dinosaur fossils. The three Monument fragments left under the new proclamation leaves fossil-rich geological strata, as well as entire geological stairsteps in the staircase, unprotected. 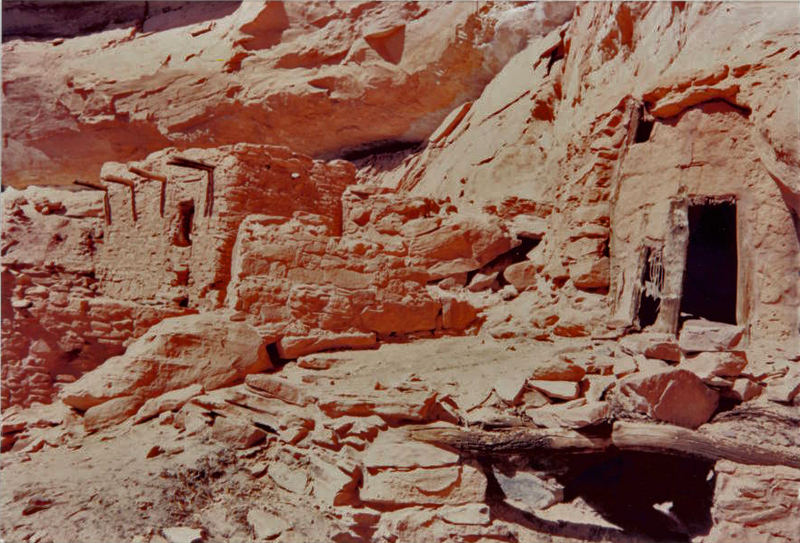 The Bears Ears National Monument was established to protect one of America’s richest collections of ancient cliff dwellings and other sacred sites. The eviscerated fragments of National Monument that remain at Bears Ears after Trump eliminated protections from 1,149,973 acres leave the vast majority of the area’s priceless ruins and geological wonders unprotected. The Trump administration is peddling a fake-news narrative that the concerns of tribes and local communities were ignored when the Monuments were designated, even while it ignores the concerns of tribes and local communities that want the Monuments to stay protected just the way they were originally designated. In 2015, the Navajo, Hopi, Ute, Zuni, and Ute Mountain Ute tribal governments came together to form the Bears Ears Inter-Tribal Coalition, which drafted a comprehensive proposal for the designation and management of Bears Ears National Monument. It was the first time that Native American tribes petitioned to establish a National Monument under the Antiquities Act, and Bears Ears ultimately became the first National Monument where the tribes would get a major role in management. Bears Ears and Grand Staircase – Escalante were opposed by industry lobbyists and their cronies in the local county governments. What they lacked in numbers, they made up for with money, political connections, and noise level. These right-wing demagogues parroted the tired old script that misrepresents westerners as demanding exploitation of public lands for corporate gain regardless of the environmental consequences. In reality, western public opinion increasingly favors wildlife conservation, recreational values, and quality of life as priorities over industrial use of public lands. It’s the same old story on a different news cycle. Theodore Roosevelt created Grand Canyon National Monument in 1908, overruling years of opposition by miners, ranchers, and settlers. Today, this park is an American icon. The following year, Roosevelt set aside 750,0000 acres of Mount Olympus National Monument to protect the dwindling elk that now bear his name, over virulent objections from the timber industry. Today, it is one of our most popular National Parks. In 1943, Edward Robertson (R-WY) stood up in the U.S. Senate and condemned Franklin D. Roosevelt’s establishment of a National Monument in Jackson Hole as “a foul, sneaking Pearl Harbor blow” in the midst of World War Two. The local county is now the wealthiest per capita in the United States, thanks to its protected public lands. “I don’t think it is controversial, actually,” President Trump remarked of his Monuments repeal in Utah, having insulated himself inside the state capitol. Outside, crowds of angry demonstrators incensed by Trump’s anti-conservation shenanigans thronged the capitol grounds, blocked from getting in and having their voices heard. Throughout American history, there has always been an industry or a user group eager to exploit our public lands for their own private gain, and spoil things for the rest of us. Today, the oil industry, the coal industry, and the livestock industry are the main culprits. Now is not the time for compromise and collaboration with the enemies of conservation, but to stand up and fight back. It is when the public speaks out, as they did in their millions in response to the Trump Monument “review” process, that major conservation gains are made. After all of the empty rhetoric from President Trump and Secretary Zinke about honoring the legacy of Theodore Roosevelt, they now are proving the early skeptics right by attacking his signature conservation achievement: The National Monuments system that President Roosevelt signed into law in 1906. The Trump administration has chosen to ignore the vast majority of Americans across the country who want the Bears Ears and Grand Staircase protected. This unprecedented raid on America’s conservation heritage spawned an angry public backlash, including lawsuits by the tribes on Bears Ears and by environmental groups on both National Monuments. The American people have had enough. Our anger is beautiful, our indignation is righteous, and our victory will be decisive. Erik Molvar is the executive director of Western Watersheds Project, a nonprofit conservation group working to protect western watersheds and wildlife, and suing to restore Bears Ears and Grand Staircase National Monuments to their full measure of protection. He also is the author of Hiking Zion and Bryce Canyon National Parks, Hiking Olympic National Park, and 15 other guidebooks to western public lands. Nice piece, Erik, thank you. I believe your critical work is the tip of the spear of a coming major backlash against the profane actions of the current GOP and their obscene grabbing of our land and of women, both. Be aware that Congressmen Curtis and Stewart from Utah have introduced scam conservation legislation that would kill the tribes’ lawsuit against Trump. Why does the GOP seem to know every dirty, sneaky trick in the book? I think Joyce Behar is right: “When they go low, we go lower”. Something has to change…quickly. I wonder when the term “access” came to mean only motorized “access” or “access” with the purpose of looting and destroying ? There is one name that is going to bring this president down. Sater; so it is just a matter of time when all of the people in the united states knows the dealings of this man when it comes to protect environments. Boycot the stupid and wasteful sport of golf. let’s just make in west palm beach in his mar a lago property let see how he likes it. In 2016, 7 million citizens voted for the green party. If they had voted for Hillary, then Trump would not be president. What a waste!!! If all the Hillary voters voted for Bernie Sanders or the Green Party, then Trump would not be president.